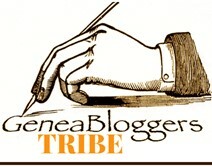 During November, I pledge to write a post each day to at least one of my three blogs. Hopefully, I can find enough inspiration to post to more than one, but realistically, I’ll only promise to post to at least one each day. Since AncesTrees is my primary blog, this is where I’ll be writing most often, which means that I’ll be trying hard to find something interesting to say about my ancestors, or genealogy, or family trees, or cemeteries or any of the dozens of tags I’ve attached to this blog. The hardest part, is of course to keep it interesting. And I pledge to read posts from at least one other blog each day. I’m going to really enjoy this part of the challenge because there are so many fascinating people blogging about everything imaginable. In addition to learning something new each day, I’ll be seeing new styles of writing and ways of thinking! Talk about broadening my horizons, and all without leaving the comfort of my desk chair. So thanks for hanging with me during the month of November, and if you are participating in NaBloPoMo as well, let me know and I’ll be sure to check out your blog as well. Love the idea of NaPloPoMo thanks for sharing.